Down to earth, friendly and colorful, Woodstock has a cozy, easy atmosphere to mix, mingle, make new friends, and move about comfortably in any language. Ideally situated in the heart of Monmartre, the guest is able to explore the City of Lights by foot or with easy metro and bus access. WOODSTOCK is located at the foothill of the Picturesque Montmartre,most exciting neighbourhoods in Paris. 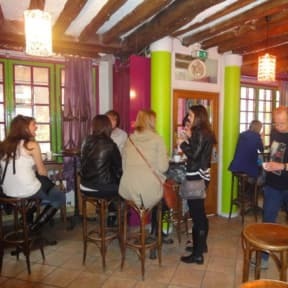 Here you will find many cafés, clubs, bars and artist and musician hangouts. We do have a cat ! * NEW! FREE WIFI CONNECTION ! AND COMPUTERS AT YOUR DISPOSAL !!!! Watch out, though once you're here, you might never want to leave. 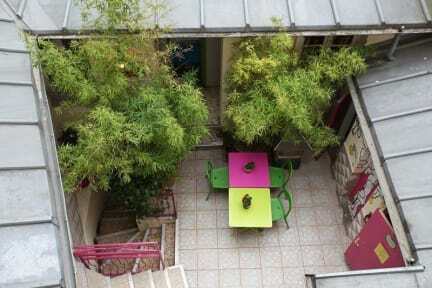 Woodstock Hostel Montmartre is much more than a hostel... it's a way of life. Here we know your name and you will really feel in a special place. *The Hostel has a lock-out ((rooms only) are closed for cleaning) from 11a.m. until 2p.m. * Please note that guests under 18 years of age must stay in a private room with guardians. They cannot share in general dormitory rooms with people who are not part of their own group or family. Under-18s are not allowed in the bars or pubs. If you do not make this clear and book children into a mixed dorm, your reservation will be cancelled upon arrival and you will not receive a refund. For group of 10 people and more.